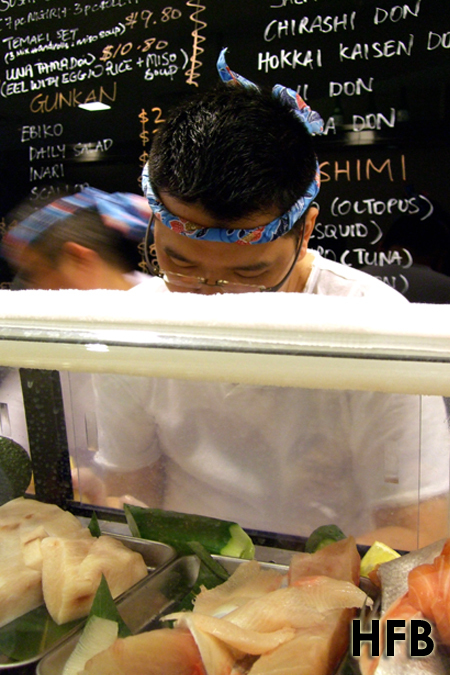 Stand, order, and eat – sushi that is, where the seafood are flown in from Japan everyday. This Japanese dining concept by Standing Sushi Bar is geared towards the fast-paced environment of Shenton Way, where professional desire quality food at a snap of their fingers. However, come dinner time, out comes the high chairs and the shop is turned over for “by reservation only” Omakase dinner ($50 per pax) – where dinners leave the selection of the evening’s menu to the chef and expect him to be innovative and surprising in them – which usually also includes the day’s best offerings. 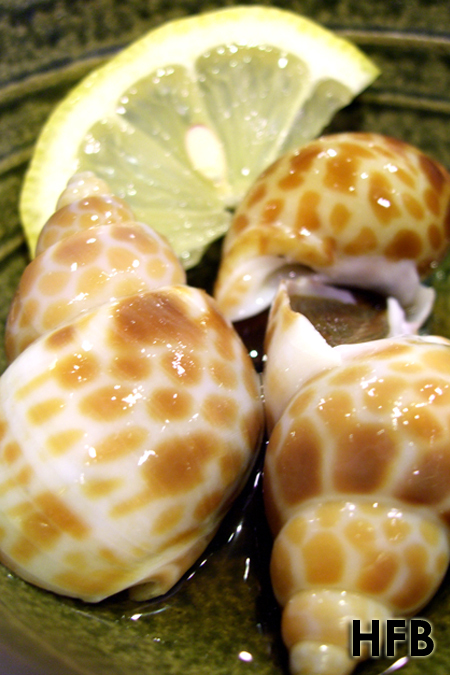 First up, Japanese Sea Snails that was served chill. HFB absolutely digs shell food and this dish was excellent in many ways. 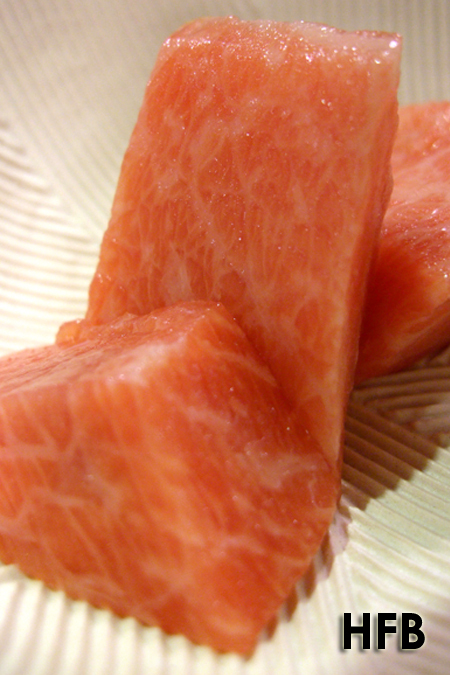 The cold temperature succeeded in drawing out the natural sweetness and the firm chewy texture of the flesh. He could probably finished dozens easily. The Hokkaido King Crab Leg with Home-made Miso was yet another simple but outstanding dish. 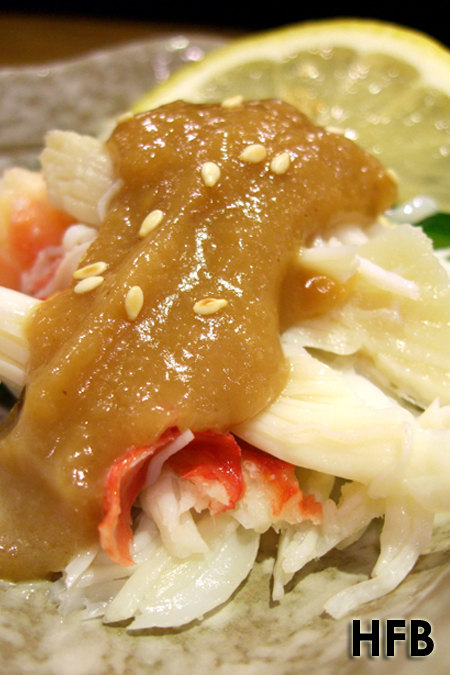 The crab eluded a natural “sea flavour” that was appetising and the miso sauce was robust with flavour. The only drawback was that the sauce tended to overwhelm the natural taste of the crab. Sashimi Moriwase consisted of Maguro (Tuna), Sake (Salmon), Mekajiki (Swordfish), Hamachi (Yellow Tail) and Hotate (Scallop). Fresh and came with good thickness – there was really nothing bad to pinpoint on. Worthy mention goes to the Hamachi Belly that was all natural Omega 3 goodness! 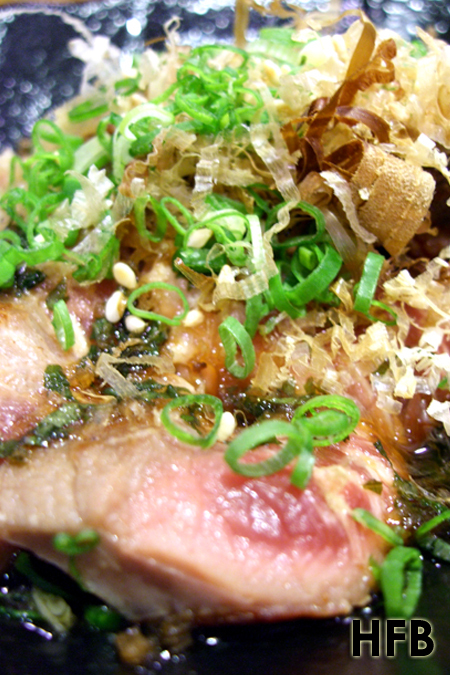 By now, HFB wasn’t surprised that the Karubi Beef Tataki with Bonito Flakes and Spring Onions was well executed. The marbling was great and the meat was succulent. 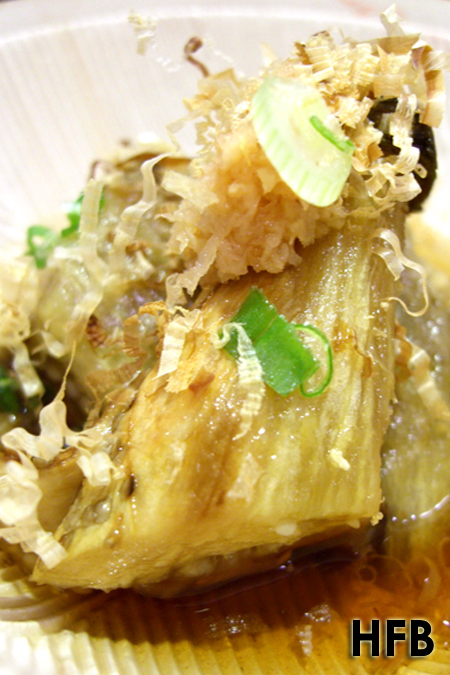 The bonito flakes also provided a nice salty touch to the dish. Served chilled as a palate cleanser, the Egg Plant with Light Soya Sauce came with a hint of Grated Ginger. Unless one is a fan of egg plant, it probably would be too squashy for you. Otherwise, HFB thought it did a good job in clearing the palates. HFB loved soup and the Steamed Hotate Soup with Tofu didn’t disappoint. However, if one expected the scallop to taste as good, you will be disappointed since its essences were all captured nicely in the clear soup. A sushi bar ain’t worthy to be addressed as one if there weren’t sushi offerings during the Omakase. Trio of Maguro, Hirame (Flat Fish) and Anago (Boiled Salt-water Eel) were presented and they were nothing short of excellence in terms of freshness. 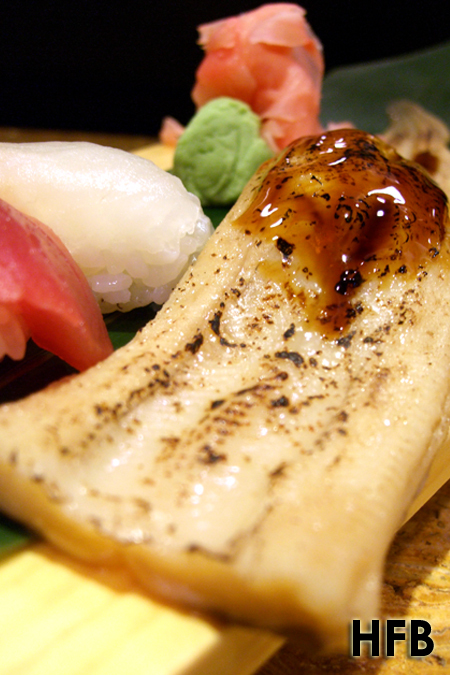 The boiled eel was remarkably exquisite and was only prevailed by that of HFB Tsukiji’s Sushi Dai experience. 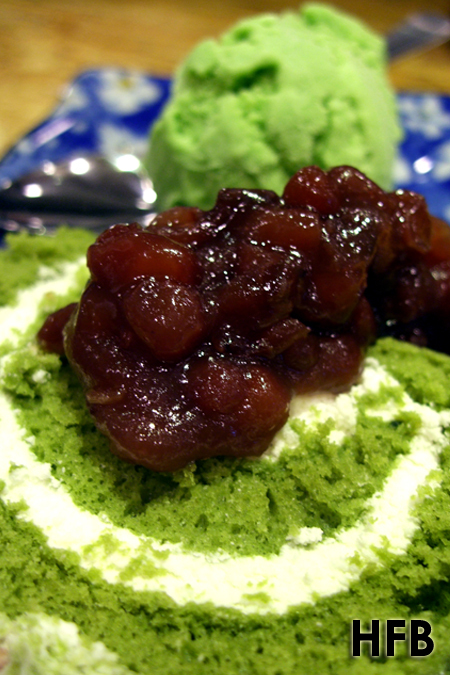 Matcha Ice-cream with Green Tea Cake Roll and Red Bean Paste was the last order of the evening. The red bean paste was enjoyable, although one can probably grab the cake and ice-cream off the shelves of some reputable Japanese supermarket. They say good things come in small packages and the evening's pleasant surprise was the offering of 3 complimentary thick cubes of Otoro, or Tuna Belly that was what's left for the day. WOOT! Overall, it was an unexpectedly enjoyable dinner. HFB was really filled by the end of the meal, and the personalise touch of Chef Roy explaining each and every dish sums up the lovely evening. Next up, braving the Shenton Way lunch crowd for the REAL standing sushi experience! 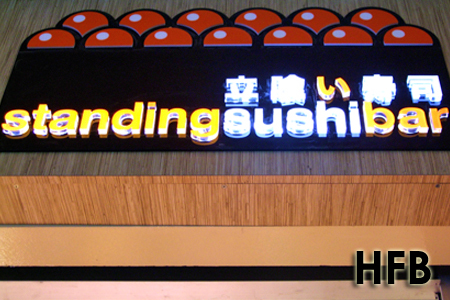 Wish I'd known about this sushi place when I was in Singapore in August. Sounds like a great place. Will have to try it next time I return. he'll be standing lots come the singles event. haha. 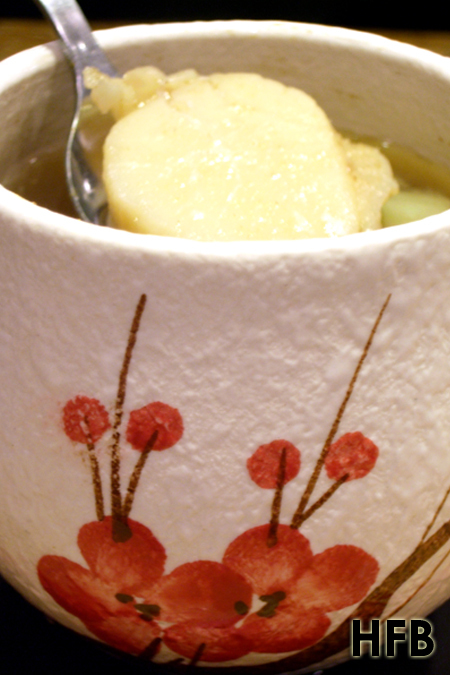 The homemade miso looks good by the way. ahh... it looks so yummy!!! We're so tempted to go try out the Karubi Beef Tataki! It looks so juicy and tender. @Kian: I reckon for its price - the food is pretty reasonable. @SiHaN: ssHHhh... there's no announcement yet...But yeah... the home made miso was robust and tasty. @SF: Booked early! Friday or Saturday are good - FYI Tue and Fri are when the seasonal produce are flown in. The usual stuff comes in fresh daily. SistaFood: It depends on whether they are offered during the Omakase, I dun think it's part of the ala carte menu. However the good news is that they tied down with a meat supplier recently, so hopefully they will have more beef offerings. I've been curious about this place. 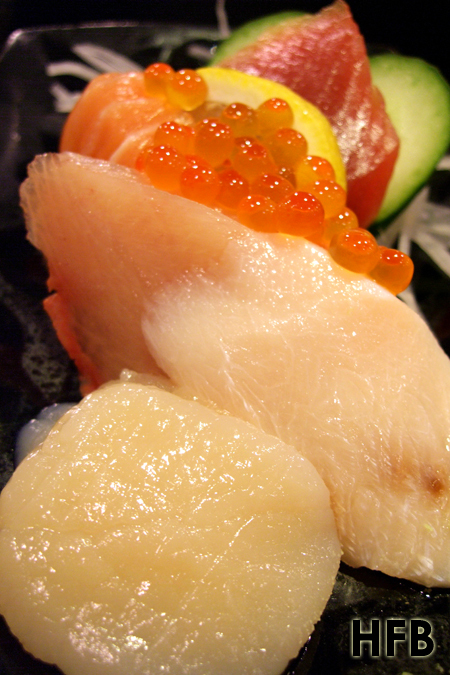 The Omakase dinner sounds like a good deal with fresh offerings. @wayangtimes - our number is 6533 7078. We're open Monday - Saturday from 11 am - 10 pm and our omakase is available through reservation for dinner. It starts at 50 sgd per person and upwards (you can specify your budget when making the reservation booking). Thanks HFB for the review! @noobcook: It is. You should make your trip down soon before it gets too crowded! @Howard: LOL. Will definitely do that real soon, promise! Another food lover's blog yeah :) thanks for sharing unbiasedly the fine dining at SSB.. gonna try it next time cheers! For S$50 that is extraordinary value. Try recreating it at home and see what it costs you. The Egg Plant with Light Soya Sauce is the stand-out for mine, but I have to say the Karubi Beef Tataki with Bonito Flakes and Spring Onions looked and sounded magnificient. Thankfully I'd just eaten before reading this post, or my drooling would have been an embarrassment! @Steve - Indeed, I really enjoyed the Karubi Beef Tataki! Wouldn't mind a 2nd serving at all.